The common ringed plover (Charadrius hiaticula) belongs to the family of lapwings and plovers, the Charadriidae. The common ringed plover species is distributed in northern Europe, northern Asia, Mediterranean region, Middle East, Africa and southeast India. These plover species breed in Arctic coast and Arctic tundra. These plovers are polytypic species. The common ringed plover (Charadrius hiaticula) is a small plover, measuring 17 to 20 cm in length and weighing 40 to 80 grams. The wingspan is 50 to 60 cm. The common ringed plover has grayish brown crown, back and wings. The underparts are white. There is a white neck band with a black band below it. The forehead, chin and throat are white. There is a black mask around the eyes. Juveniles have duller plumage. The bill is short and orange in color with black tip. The irises are blackish. The feet are orange and the outer two toes are slightly webbed. Juveniles have blackish bill and yellowish legs. The call of these plover species is a mellow, whistling, "pee..pee" sound. These common ringed plovers are distributed in Greenland, Iceland, northern Europe, northern Asia, Mediterranean region, Middle East, Africa, Madagascar, Sri Lanka, Maldives, Lakshadweep (India) and west and southeast India. In India, wintering common ringed plovers are distributed in the states of Gujarat, Tamil Nadu, Telangana and Andhra Pradesh. They also occur in Lakshadweep Islands off the west coast of India. The common ringed plover nominate subspecies C. h. hiaticula is distributed in Scandinavian countries, United Kingdom, northwest coast of France and coastal Belgium. The populations from Scandinavia migrates to Africa while rest of them are resident. The common ringed plover subspecies C. h. psammodromus is distributed in northeast Canada, Greenland and Iceland. They winter in southwest Europe and western Africa. The ringed plover subspecies C. h. tundrae is distributed in north Scandinavia and north Russia and northeast Russia. They winter in Caspian Sea, Middle East, southern Africa, southern India and Sri Lanka. The Important Bird and Biodiversity Areas (IBA) of these common ringed plovers in France are, Cap Gris-nez, Camargue, Bassin d'Arcachon et Banc d'Arguin, Baie du Mont Saint Michel et Ile des Landes, Baie des Veys et Marais du Cotentin and Baie de Goulven. Some of the IBA of the common ringed plovers in United Kingdom are, The Swale, Tiree and Coll, Severn Estuary, The Wash, South Down Coast, North Norfolk Coast, Morecambe Bay, Mid-Essex Coast, Mersey Estuary, Humber Estuary, Hamford Water and Benfleet and Southend Marshes. These common ringed plover species do not normally occur in forests. They normally occur in altitudes from 0 to 100 meters. The artificial ecosystems and habitats of these species include flooded agricultural fields and tropical and subtropical flooded pasturelands. The natural ecosystems and habitats of these common ringed plover species include, flooded grasslands, freshwater lakes, rivers, streams, estuaries, marshes, intertidal shorelines, mudflats, marine lakes and lagoons. The diet of this common ringed plover consists mainly of invertebrates. Small crustaceans, molluscs, worms, insects, insect pupae and larvae, beetles, ants and flies are their primary food. They feed on the dry ground as well as on mud and shallow waters, locating their prey by sight. The breeding season of these common ringed plover species is from April to July in most of their breeding range. These species are monogamous and territorial. 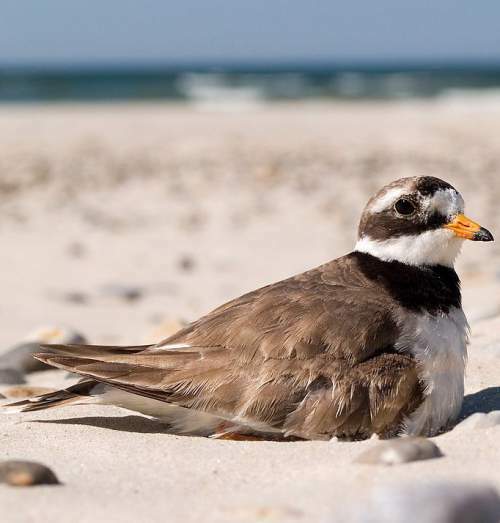 The nesting sites of the common ringed plovers include Arctic coast, Arctic tundra and sand or shingle beaches. The nest is a shallow scrape on dry open ground on the beach. The clutch contains 3-4 pale buff eggs with gray and brown spots. These common ringed plover species are mostly migratory birds. Breeding populations occur in Arctic coast and Arctic tundra, spanning northeast Canada, Greenland, Iceland and northern Eurasia. The common ringed plovers migrate southwards from August onwards for wintering. The return migration to the breeding grounds occurs in early summer. The populations in United Kingdom and coastal France and Belgium are resident breeders. The global population size of the common ringed plover (Charadrius hiaticula) is estimated to number about 415,000 to 1,400,000 individual birds. The overall population trend of the species is considered to be decreasing. In most of its range, this plover species is reported to be locally common to uncommon. The generation length is 5.1 years. Its distribution size is about 40,400,000 sq.km. Habitat alteration and destruction, climate change, severe weather, avian botulism, predation by feral species and capture of adults and juveniles for pet-trade are the main threats that are endangering the survival of these plover species. The common ringed plover (Charadrius hiaticula) does not approach the thresholds for being Vulnerable, either under the range size criterion, or under the population trend criterion or under the population size criterion. The CITES (Convention on International Trade in Endangered Species of Wild Fauna and Flora) status is ‘Not Evaluated’ for the common ringed plover (Charadrius hiaticula). The common ringed plover (Charadrius hiaticula) is closely related to the semipalmated plover (Charadrius semipalmatus) and the long-billed plover (Charadrius placidus). The three recognized subspecies of the common ringed plover (Charadrius hiaticula) are: Charadrius hiaticula hiaticula Linnaeus, 1758, Charadrius hiaticula tundrae (Lowe, 1915) and Charadrius hiaticula psammodromus Salomonsen, 1930. Current topic in Birds of India: Common ringed plover - Charadrius hiaticula.